A friend asked me what I thought about water labelled as “non-GMO and gluten-free.” Since water is not genetically modified and never contained gluten (a protein found in some grains), it is a great marketing ploy to separate her from her money. Shortly after that conversation, another friend said she was looking for non-GMO pizza crust. Again, a head scratching moment because wheat is not genetically modified. Pizza dough is made from wheat flour so how could a wheat pizza crust be non-GMO? It reminded of the time when everyone was worried about cholesterol and marketers and food companies took advantage of our fear. Suddenly, foods like peanut butter and potato chips were carrying cholesterol-free stickers…two foods that never, ever contained cholesterol. What does genetically-modified (GM) or GMO mean and should you be buying non-GMO foods? A little biology review. This chart from the non-profit International Service for the Acquisition of Agri-Biotech Application (http://www.isaaa.org/) shows the ways our food can be modified. “Genetic modification is the fasted adopted crop technology in history,” says Jennifer Armen of Okanagen Specialty Fruits. Most of us are familiar with breeding, but the other three technologies might be new to you and they sound scary. But, as Jack Bobo, Senior Vice-President and Chief Communications Officer for Intrexon and former Senior Advisor for Food Policy for the U.S. State Department, says there is a difference between “a health scare versus something that is scary but healthy.” Why would we adopt something that sounds scary? To be sure, there is profit for the companies that develop and sell new biotechnology to farmers but that doesn’t make it bad. Drug companies make plenty of money on our prescription drugs, but that doesn’t make them bad for creating a product that lowers our blood pressure or cholesterol. Others who benefit from biotechnology is the farmer. According to one farmer, who grows GM corn, it allows her to use less pesticides, protects against soil erosion, and plant drought-tolerant seeds that help produce a better crop. She adds that we embrace technology in all aspects of our lives except when it comes to growing food. (You can read her story on the US Farmers and Ranchers Alliance website at http://www.fooddialogues.com/headlines/gmo/why-we-grow-gmo-corn-on-our-farm). The benefits of GM food crops haven’t really made it to consumers, but that is about to change. I think that once consumers see tangible benefits, they may not be so scared of GM foods. Later this year, the Arctic Apple (Okanagen Specialty Fruits http://www.arcticapples.com/) will appear in some test markets and should be widely available in 2017. What makes this apple special? It won’t brown when cut or sliced. No need to add an antioxidant, that often alters the taste, to prevent yucky brown apples. That sounds appealing to me, but everyone wants to know if it is safe to eat. Okanagen Specialty Fruits started field trials in 2002 and collected over 10 years of data to evaluate the fruit or any effect it would have on the environment. It took 5 years of petitions and reviews by 4 agencies (2 in the U.S. and 2 in Canada) to determine it was safe and get approval to plant the apple trees in Washington State. So, the USDA says it is safe to grown and the FDA says it is safe to eat. 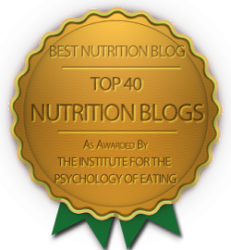 The nutritional profile is the same as a conventional apple. How did they do it? 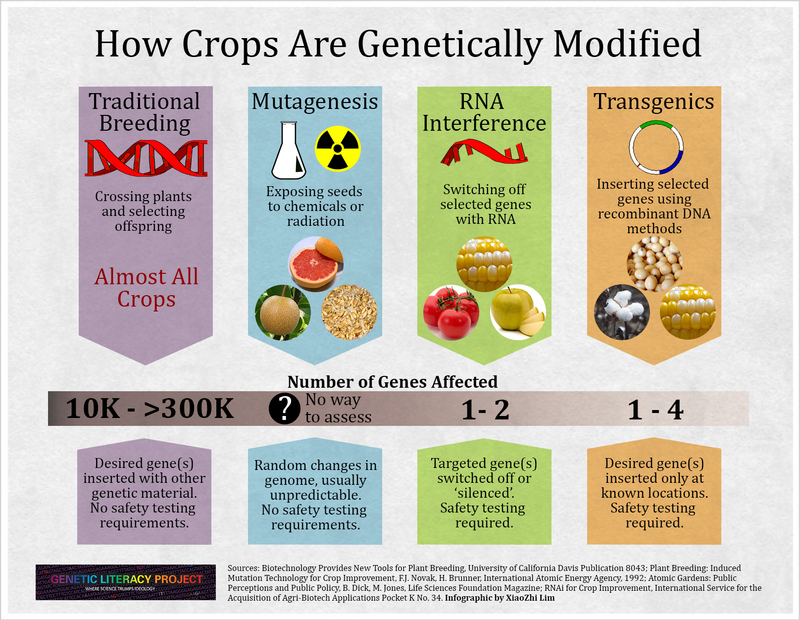 Looking back at the chart on how crops are genetically modified, the 3rd panel show the technology used. They took the DNA from the apple itself to silence or “turn off” the gene that causes browning. 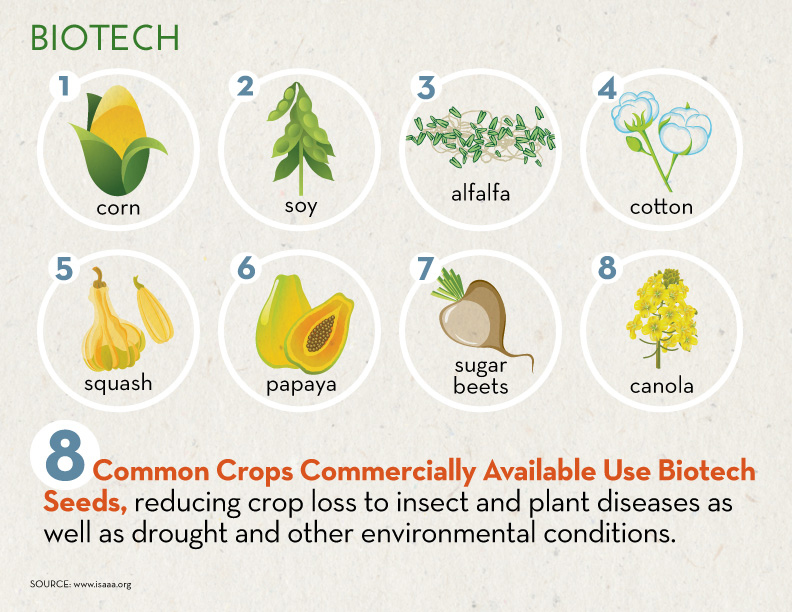 Currently, only 8 GM crops are available and these are corn, cotton soybeans, canola, alfalfa, papaya, squash and sugar beets. Arctic Apples have been approved for consumption, but consumers won’t see them until later this year in test markets. Greg Jaffe, Director of the Project on Biotechnology for the non-profit consumer organization, Center for Science in the Public Interest (CSPI) says that there is no evidence that the current GM foods or ingredients from the foods is harmful to humans. This is based on the conclusions of multiple agencies including the USDA, the National Academy of Sciences and European Food Safety Authority (for detailed information on CSPI’s Biotechnology Project see http://www.cspinet.org/biotech/). Jaffe believes a “case by case” approach is best in evaluating new GM crops as they enter the marketplace, with stronger input from the FDA. “Biotechnology is not a silver bullet to solve world hunger and not the solution to all agricultural issues faced by farmers around the world, but it can be used as a tool to benefit farmers, the environment, and the consumers,” says Jaffe. In the end it comes down to consumer choice. If after you learn more about GM foods and decide you want non-GMO you can buy organic foods or look for the non-GMO verified seal. One word of caution, a junk food is a junk food, so if you buy non-GMO snack foods, cookies, and frozen pizza you aren’t doing your health any favors in the long run! I used the graphics from isaaa.org for educational purposes. Information on Arctic Apples came from a webinar sponsored by the Produce for Better Health Foundation and other information came from a conference that included speakers Jack Bobo, Greg Jaffe and USFRA farmers and ranchers. I have no consulting or financial interest in any of the companies mentioned in the post and I was not paid to write this article.